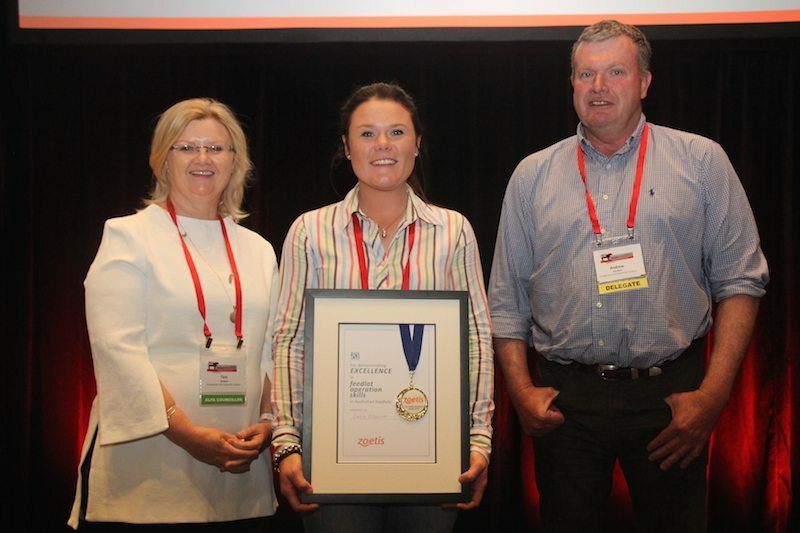 2016 Zoetis medal winner Cailin O’Connor and Tess and Andrew Herbert from Gundamin Feedlot, Eugowra, NSW. What’s the secret to being a good pen rider? Concentration, and experience in different situations, conditions and climates, says 2016 Zoetis Medal winner Cailin O’Connor. Ms O’Connor, a pen rider at the Gundamain Feedlot at Eugowra near Orange, NSW, was named as the winner of the prominent feedlot industry award at the Australian Lot Feeder’s Association (ALFA) biennial BeefEx conference the Gold Coast on Wednesday. Runner up was Brendan Orr, Feed and Milling Coordinator at Mort & Co’s Grassdale Feedlot near Dalby, Qld. The Zoetis Education Medal recognises the achievements of young people in the feedlot industry who have performed well in one of the tailored feedlot operations Certificate III courses conducted through New England TAFE at Armidale. Zoetis’ feedlot and corporate account manager Andrew Malloy said the award is an important vehicle to recognise and reward the critical role that production level workers play in the Australian feedlot industry. It is easy to get the sense Cailin O’Connor will be working in the feedlot industry for a long time to come. She was introduced to the cattle industry at an early age, regularly attending cattle sales and bull sales with her father Peter O’Connor, a well-known stock agent with AJF Brien and Sons at Coonamble. “He took me forward and really got my passion going for cattle,” Cailin said. Exposure to an Angus stud and showing cattle as a student at Kinross Wolaroi School in Orange further cemented her desire to pursue a career in the cattle industry. After working on cattle stations at Cloncurry in north western Queensland, she accepted a job with Tess and Andrew Herbert at Gundamain Feedlot. Cailin knew the Herberts well, having attended school with their daughter Caitlin. Since joining the Gundamain team Cailin has undertaken a Certificate III in Feedlot Operations – Pen Riding and animal welfare training through ALFA. She has also previously completed a year of agricultural business management studies at Charles Sturt University at Orange. A pen rider’s primary job is to maintain the health and welfare of cattle in a feedlot. They ride through pens looking for signs of distress, illness or injury. Early starts are required, in any type of weather. High levels of cattle handling and horsemanship skills are also essential, and something else: an ability to ‘read’ cattle. It is a skill that can be hard to teach, and is not one that everyone will get, says Tess Herbert, who is also the president of the Australian Lot Feeders Association.ALFA invests heavily in providing industry training to maintain professional standards of stock handling, animal health and welfare, feeding and nutrition and people and business management skills throughout the Australian feedlot industry. Pen riders need an eye for detail, and ‘what doesn’t look right’, Tess explained. “Andrew describes it as the day before you get the flu, there are no symptoms but you just don’t look right,” she said. “You need people with a feel for cattle, and it is hard thing to do. 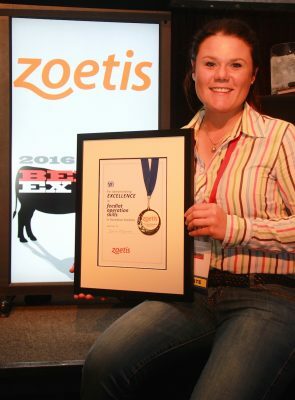 Cailin told Beef Central she was very honoured to receive the award..
She said an address to yesterday’s conference by Dr Heather Bray from the University of Adelaide encouraging people in the cattle industry to speak positively about the industry resonated with her. “Just really publicising that we are in this industry because we love it, and to feed our country and other countries, we don’t do it because we have to. Tess Herbert said she was very proud of Cailin’s achievements. She said a couple of livestock supervisors had been away this year and Cailin had stepped up and filled in admirably. “This is what she wants to do,” Tess said. “The value of people of people like Cailin to your business is just enormous, you want to invest in people like her and to keep them in our industry.